My brain is tired. I am sure your brains are all tired too. It has been one hell of a year, in global terms. I am sure many of us are really ready for 2016 to be over already. And, given that the festive season is almost upon us, many of us will be seeing out this year with a well-earned holiday. 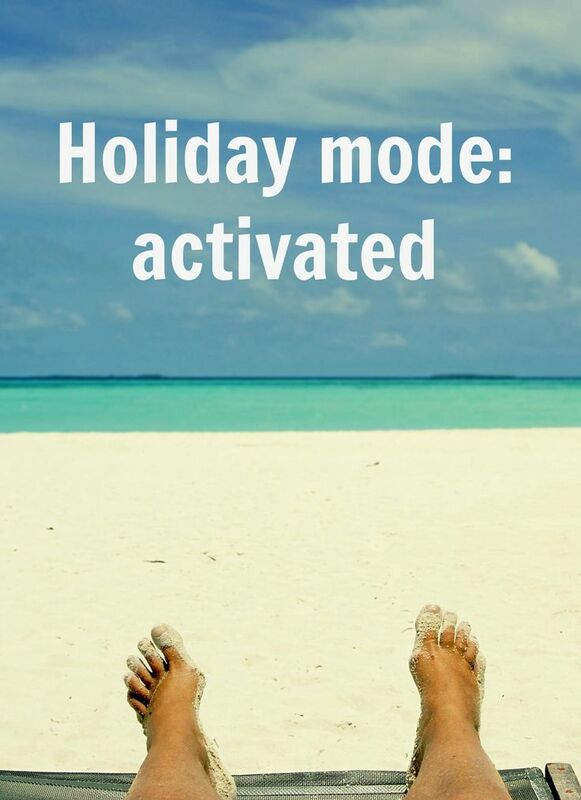 Leave from our day jobs, kids on holiday so less frantic mornings, and time to catch up on sleep, novels, movies and whatever else you do when you are on holiday. It’s also, for researchers, an opportunity to take a break from your reading, writing, thinking and data crunching. I am a firm advocate of having a holiday from your research. I know, though, that many postgraduate students who are also working while studying see their end-of-year leave from work as a big chance to crack on with the writing and research without the usual disruptions of work. However, as a lovely friend who is coming to the end stages of her PhD said recently, ‘why am I assuming that I will be able to crack on, when I am pretty much on empty now?’ I, too, have been assuming that, once I go on holiday, all the energy I don’t have now will suddenly and miraculously appear and I’ll be zipping around doing crafts and making cookies and finding my desk under the piles of rubbish that it is buried under. I will more than likely be horizontal, with a book, in my pyjamas, bribing my husband and kids to bring me tea and snacks so I don’t have to move. Copyright image Belle Kim, Zachary Elgar, and A Prolific Source, 2015. I have much writing waiting to be done – primarily for a book project I am way behind on. But there is just no way I am going to be able to do any of it now. And anything I did write now would most likely have to be deleted and rewritten in January anyway. I am, quite simply, on empty. I need to see this for what it is: not as some kind of inability to Get The Things Done, but as a sign that I have actually done many of The Things this year, and now my body and my mind need to rest. 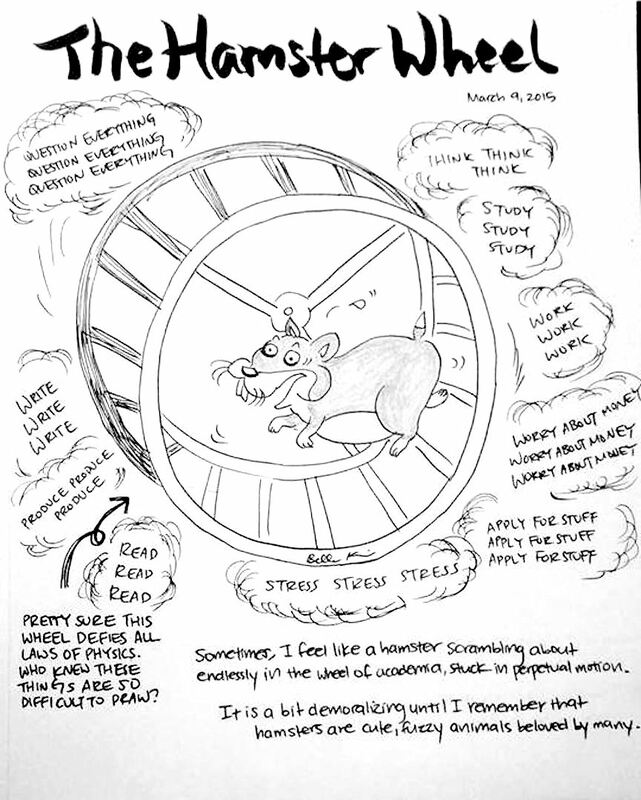 Too often, on the hamster-wheel of academia, we don’t appreciate the need for rest, and down-time, and we put so much pressure on ourselves to just keep going. But if we do, we risk damaging our health, both mental and physical. I know I am guilty of bullying myself into keeping going, telling myself that I don’t need down time; I need to be productive. There is a balance to be struck here. Down time is necessary and useful – it can recharge your creativity, productivity and work mojo. But too much down time can be counter-productive, as it can be really tough to get going again if you have too much time off. I don’t think this is necessarily the case with a regular job, but I have certainly found it to be the case with research, and a PhD. I never really got the balance right during my PhD – I either took too long a break or not enough of one, and I pretty much bunny hopped my way through my PhD in fits and starts of progress and productivity. I always found it difficult to get back into my PhD after each of the end-of-year breaks, largely because I was starting up my writing centre again, with all the attendant busy-work that entailed, and my PhD kept being relegated to ‘tomorrow’ or ‘next week’. I don’t have that excuse anymore, but starting up again, especially on a project for which you are making the deadlines, and that requires intrinsic, rather than extrinsic, motivation and drive, can be a challenge. I do not, sadly, have the magic solution to finding this balance. I do, however, have the advice I give myself. Rather than telling myself I am not allowed to think about my research, I tell myself I don’t have to. I can read, and potter around, and read, and bake and swim and lie in the sun, and not feel guilty about any of it. And I can do that until my kids go back to school. This gives me about 3 weeks off. But, what usually happens while I am pottering and baking and lying in the sun, is that my mind-at-rest will still be percolating away about the book I am working on, or this blog, or the paper I want to write before March, and I will be inspired or have a useful idea that I need to jot down. So, I do. I scribble it into my research journal, or voice-note it on my phone, and then I put it down and go back to the holiday. That way, all the ‘work’ I might do is a bonus, and it doesn’t come with the usual anxiety and stress because I am not expecting myself to do it. This way, I keep things ticking over just enough to be able to pick up the pace when the holiday is over, but not so much that I don’t allow myself the rest I need.